Bus Rapid Transit has become an increasingly popular concept for communities in the DC area, but to see it in action, you'd have to travel to Cleveland or Los Angeles. This week, you can get a glimpse of our possible future at the Montgomery County fair in Gaithersburg. Photo by betterDCregion on Flickr. 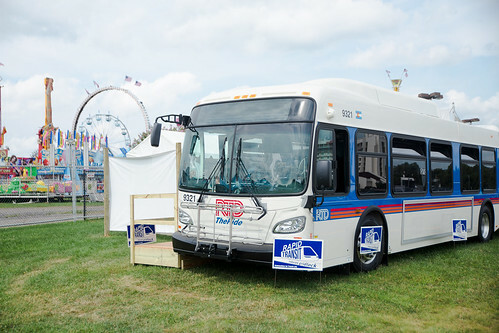 Communities for Transit, a local nonprofit that promotes Montgomery County's Bus Rapid Transit plan, set up a brand-new bus to display outside the gates of the fair, which began last Saturday and runs through this Saturday, August 16. Visitors can learn about the county's concept for an 80-mile system of bus lanes on major streets like Rockville Pike, Georgia Avenue, and Columbia Pike, and tour the bus, which will eventually make its way to Denver. At a press conference yesterday, county councilmembers and County Executive Ike Leggett said they hope to ride BRT here within four years. Getting there will require more detailed studies, which are currently underway, and securing a funding source. Fairgoers check out the bus while CFT's Scott Williamson explains how it works. Photo by the author. While the BRT plan faced intense opposition from wealthier neighborhoods like Chevy Chase West and Woodmoor, those at the fair were more receptive, asking Communities for Transit staff and volunteers when it was going to happen. Parents searched a route map to find the closest stop to their jobs, while their kids hopped into the bus driver's seat and pretended to drive. Most people don't participate in traditional community meetings, meaning a vocal minority can dominate the conversation. That's why there's a bus parked outside the county fair: it brings people into the conversation who otherwise wouldn't get engaged, revealing that public support is actually greater than we thought. And the display vehicle, with its big windows, cushioned seats, and overpowering new smell, may have changed any negative impressions some visitors may have had about riding the bus. Hopefully, Montgomery County officials will encourage people to ride the Metroway BRT line that will open in Arlington and Alexandria in two weeks. It'll be the region's first chance to actually ride BRT in person, and a prime opportunity to build support and allay some residents' concerns. 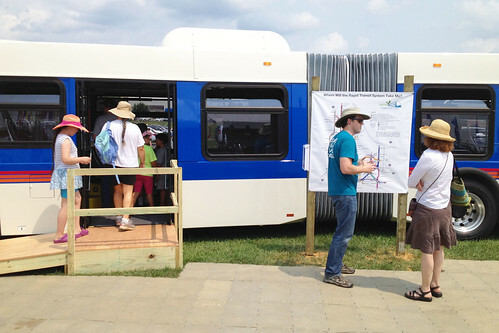 Until then, you can see the Bus Rapid Transit vehicle for yourself from 12 pm to 8 pm every day this week through this Saturday at the Montgomery County Agricultural Fairgrounds, located at 16 Chestnut Street in Gaithersburg.